The prominent aspect in your dressings is the upper torso as you hit the road. We, at Distressed Jackets, not only understand this fact but also try our best to entertain your requirements to present you with a nice collection of motorcycle leather jackets. We have a huge variety of motorcycle leather jackets range so you can pick the right color, size and design for any event coming. You'll find an extensive range of exquisite attires to treat your body with an attractive outfit. Browse through different sections or search for the jacket that fits best according to your taste and standards. If you want to revive the classic time of motorcycle leather jackets initiated by James Dean, you should go for a shirt style collar open wide from the top. The pure black color along with studded collar and hems will back your biker personality in every kind of occasion. An asymmetrical zipper closure stitched with some of new designs is also a plus feature when we look a little deeper inside of the design stuff. The next thing that catches everyone's attention is the flap pocket concept this type of motorcycle jackets have in them. If you could locate a jacket with flap pockets on waistline then it will be worth your money to invest in that classic piece of attire. Stand up collars are also quite famous amongst the motorcycle leather jackets lovers. The erect collar along with zipper pockets and front closure makes it an ideal attire for everybody to try and treat his body with a more slimmer approach. If you want to look a little modern without giving up on a classic design then you may add few colored lines across one side from shoulders to bottom. On top of that, a small pocket with zipper closure near the shoulder will enhance its appearance even more. 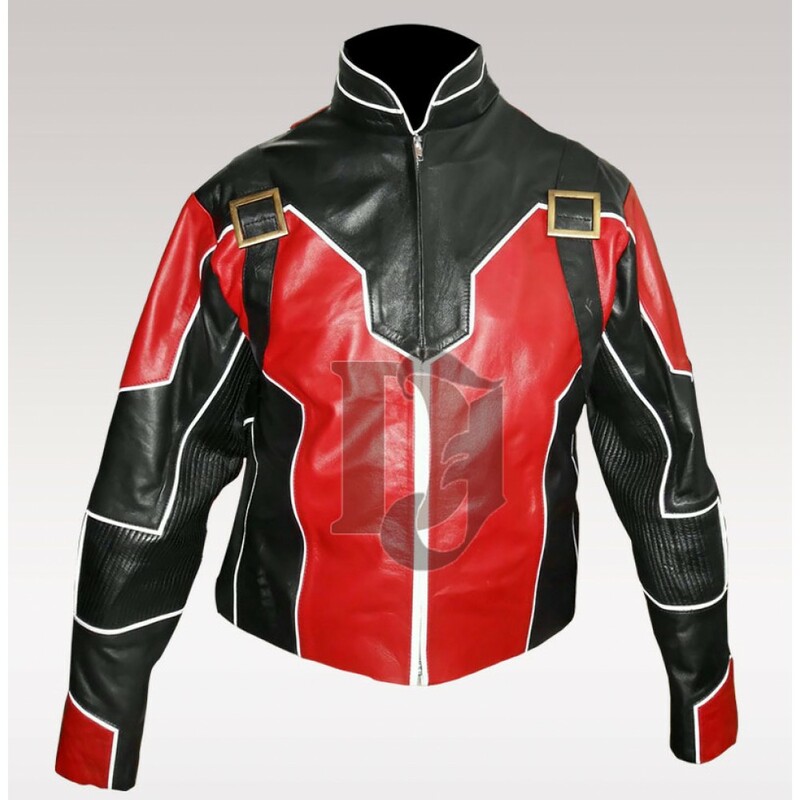 Erect collar motorcycle leather jackets are famous for having multiple zipper pockets, front closure and studded shoulders that enhance your macho personality even more when you accelerate your wheels. Most people like to give their appearance a more modern touch through a nice leather jacket. This can be done through a cafe racer jacket that is made with modern design without completely giving up on classic biker jacket's concept. You'll find an extensive range of cafe racer jackets here at Distressed Jackets to treat your body and stay the stylish guy in your social circle. If you want to be a little fancy in your jacket selection process, you may go with a celebrity jacket that you like very much. Find numerous celebrity biker jackets listed here to treat your body. Depict yourself as the Captain America or be the proud fan of Batman series through a nicely stitched leather jacket inspired from celebs. You may also find jackets with famous brands as depicted by riders or motorcyclists around the globe. So navigate through different sections and be ready to treat your body with the right jacket you were looking for earlier. Product FeaturesYellow colorWide shirt collarsFront button closureFull length sleevesCotton fabric u..
FeaturesInner of viscoseRed colorCotton finished materialHood at the backZipped closureSoft and neat..
AJ STYLE (ALLEN NEAL JONES) VEST LEATHER VEST:Allen Neal Jones, popularly called as A.J. Styles, lit.. Specifications:External: Real LeatherInternal: Viscose LiningFront: Zip ClosurePockets: Two PocketsC..
Specification:External: Leather JacketInternal: Smooth Polyester LiningFront: Zip ClouserColor: Blac..
ALLEN BLACKEST NIGHT BLUE LANTERN LEATHER JACKET:Allen Blackest Night Blue Lantern Leather Jacket&nb..
FeaturesInner of viscoseSatin finishedBlack baseQuilted patternPockets on the sidesSleeves in full l..
AMERICAN FLAG LEATHER JACKET:What would it be a good idea for me to wear today? Didn't I wear it yes..
ANTON YELCHIN BLACK BIKER LEATHER JACKET: Anton Yelchin- the Pavel Chekov of the famous Star T..
ANTON YELCHIN LEATHER JACKET:Stylish outfits is a super and best way of what is exclusive. I trust t..